CHI-TV :: "Should we keep our child's given name?" This week on CHI-TV: Families call frequently asking, "Should we change the name of our newly adopted child?" Sharon Turner, Ethiopia Program Director for Children's Hope International, discusses this sometimes "hot" topic, with both the benefits and drawbacks of both retaining birth names and also those of giving a child a new American name. Sharon's experience may help in your thought process of making the best decision for your family. If you are a family that has considered this question, join the conversation by commenting and letting us know your thoughts and insights. Watch the video "Should we keep our child's given name?" below. Having problems viewing this video? Watch it on YouTube. Children's Hope has a calling that extends to other efforts as well in Ethiopia beyond the mission of finding homes for orphaned children; one of those efforts is the Bright Hope School Project. Over the past 18 months, the 2100 students at Biruh Tesfa (Bright Hope) Elementary School have been watching the vegetables grow in their newly cultivated gardens; witnessing daily harvests of eggs from the new chicken hatchery with over 300 laying hens; and they are now drinking safe water from their new school well. The lengthy stone security wall that will eventually protect the school’s entire 13 acres is about 2/3 complete. We would like to finish the wall this summer. Even though funding has slowed the work, we are still hopeful. This has been a very fulfilling project in bringing sustainable agriculture to kids from extreme poverty. 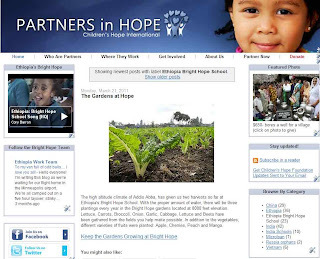 You can find out more about the Bright Hope School Garden Project; see the histroy of hard work accomplished, by volunteers and the funding of Children's Hope friends and supporters. Keep the gardens growing at Bright Hope; give here!